Was footage accidentally left out of Dolly Ki Doli? That’s the only way to account for a climax and resolution that come completely out of left field. Sonam Kapoor plays Dolly, “The Plundering Bride” as she’s known by the police. She flits around the outskirts of Delhi, marrying eligible bachelors and drugging and robbing them on their wedding night. She arranges marriages with men of various religions and traditions, requiring her to change her appearance and mannerisms to appeal to each family she’s marrying into. Dolly is a seductress only in a fantasy sense. She never so much as allows her grooms to kiss her, delaying their affection with excuses* until the drugs she’s administered have taken effect. While Dolly’s swindled grooms — including nouveau riche braggart Sonu (Rajkummar Rao) and horny loser Manjot (Varun Sharma) — are jerks, so is she. Dolly works with a group of fellow cons who pose as her family, and her fake brother, Raju (Mohammed Zeeshan Ayyub), is in love with her. Dolly knows this, and she ridicules Raju for it. Dolly’s pride derails their criminal enterprise. After being rejected as a prospective bride by Manjot’s mother for being too tall, Dolly insists on pursuing Manjot in order to take revenge on his family. This mistake lands her in the clutches of police officer Robin Singh (Pulkit Samrat), who has his own reasons for pursuing Dolly. The history between Robin and Dolly isn’t developed enough for the film’s final act to feel remotely believable. While Kapoor imbues Dolly with a fun vibe, that’s the thief’s only positive attribute. She lacks chemistry with her potential beaus, and she lacks character depth. Dolly says that she’s a thief because she’s good at it. That’s a valid enough reason, but the movie gives no sense of what ambitions Dolly has for her future, when she can no longer keep up the con. I’m still not sold on the acting abilities of Samrat and Sharma, who got their big breaks in 2013’s Fukrey. Ayyub is earnest as lovelorn Raju, but the script gives his character no room to grow. What Dolly Ki Doli does show is what a terrific actor Rajkummar Rao is. Sonu tracks down Dolly not for revenge but because he genuinely loves her. He stares at her with such devotion and longing that one secretly hopes Dolly will return to him. It’s a quality performance that deserved a better film. 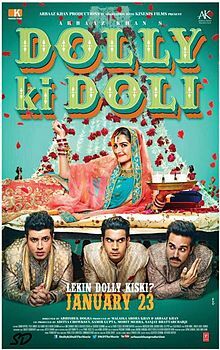 This entry was posted in Reviews and tagged 1 Star, 2015, Bollywood, chumming, Dolly Ki Doli, Hindi, Indian, Mohammed Zeeshan Ayyub, Movie Review, Pulkit Samrat, Raj Kumar Yadav, Rajkummar Rao, Sonam Kapoor, Varun Sharma on January 26, 2015 by Kathy. Dolly found her way into my home via a DVD, and I watched Sonam as Dolly twirl men around her fingers before she’d vanish into the night. I think this film had a lot of issues – especially at the end. As a film, wishing to be taken seriously, and I could be wrong about that, it would have to put on weight in order to be called lightweight. Maybe the producers ran out of money. As you said, that triple reverse ending surely came out of left field. As much as I like Sonam, and as glossily beautiful as the film looked – the story really was dreadful. Personally I am surprised that Sonam took on this role. Likewise for Rao. By the way – Ayyub, who played the fake brother, also appeared as the 4th lead in Raanjhanaa along with Sonam. Your reviews are a delight to read! Thank you very much, ashok!